Gluten-free pumpkin bread is a recipe that I have been working on ever since gluten awareness because it is such a family favorite. The recipe has wandered down many culinary alleys (some of them dark) with various flours, binders, sweeteners and never quite making it. Finally there is this recipe. It is receiving favorable comments from people accustomed to these experiments and some who have tasted them and just enjoyed them as pumpkin muffins without qualification. 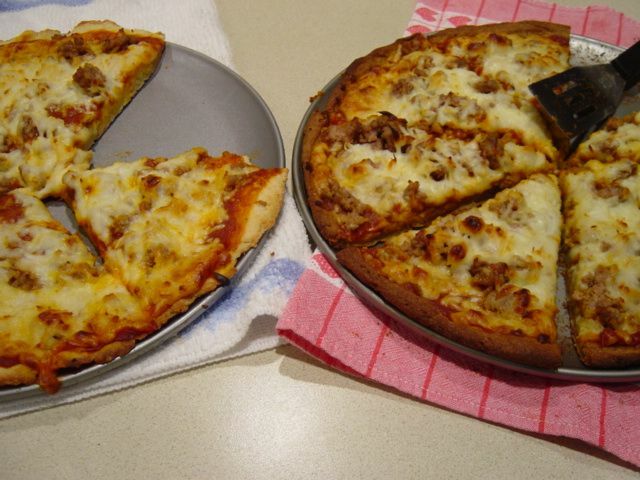 What has been really interesting is that the beginning versions that followed the original recipe exactly, except for flour, have been totally unsatisfactory. It was only after the versions using vegan binders did the texture start to become more satisfactory. This is something for future experimentation. My only disclaimer at this point is due to the fact that while the recipe has been in development it has only been baked in silicon cupcake forms. That allows for tasting fresh and warm, tasting the day after baking, and finally tasting after freezing and barely re-warming in the microwave plus having sample sizes ready-to-eat. 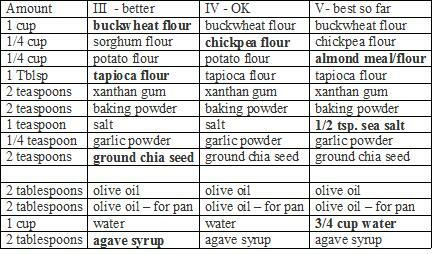 So I have not tried loaf pans yet and do not know what baking-without-gluten issues may lay there – fair warning! Preheat the oven to 350 degrees. Prepare for 20-24 cupcake size muffins or perhaps 12 large muffins. Combine the ground chia with the applesauce. Add the agave nectar and pumpkin puree and stir until combined. I have previously added some drops of stevia to make them sweeter but they are very well received without it. Set aside for about 30 minutes or so to allow the chia to absorb some moisture. Add coconut oil and vanilla just before combining with the dry ingredients as coconut oil has a tendency to congeal at room temperature. Sift the flours, xanthan, pectin, baking powder, baking soda, spices and sea salt. Add the wet mixture to the dry mixture and stir just until combined. If the batter is really stiff stir in one tablespoon of water at a time until the batter is a scoopable texture (dense and puffy). 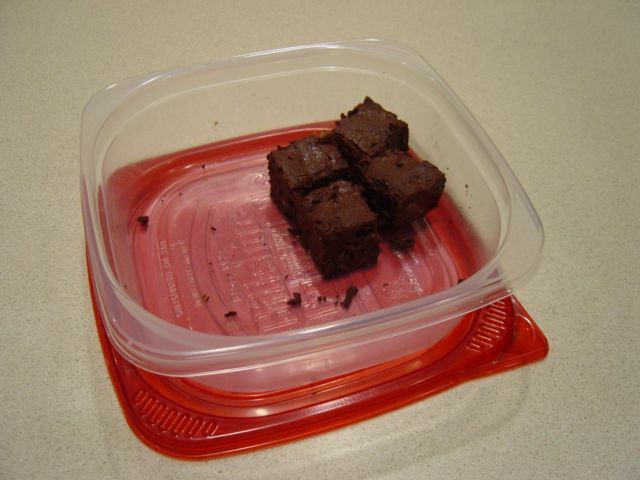 Fill your prepared bake ware to the 2/3 level. 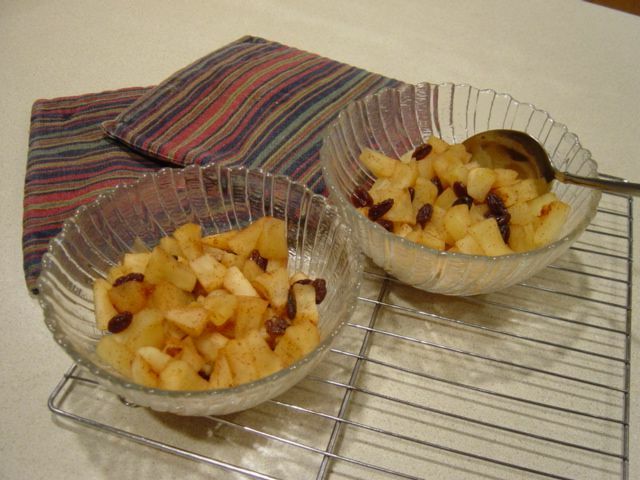 Place in the oven and bake for 20-25 minutes. Test for doneness with a tester or with a very thin knife. Allow the muffins to cool in pan on a wire rack. Turn out after 10 minutes so they don’t get sweaty. After they have cooled wrap individual servings and store in an air-tight container on the counter for 3 days or keep in the freezer. These have a very cake-like texture and I have also frosted them with a cashew cream frosting and served them as cupcakes. Sometimes it’s just destiny – a recipe appears on your radar from several directions in a very short time. It was a very unusual recipe. Simple ingredients, all of them already in the house, a very traditional recipe it seems, there was no flour in it, never had been, and first, you boil oranges – intriguing! It immediately went on the make-it-soon list. Fresh fruit is about to overwhelm me. When a season hits here, it hits hard enough to overwhelm. You can’t just pass up those bargains at the grocery – blueberries for 88 cents a carton? Between the strawberries, blueberries, and figs I was already making and freezing fruit puree so why not oranges? Except that I would use those oranges to bake this cake. Just to make sure I wasn’t heading up a blind alley I did an internet search on the ingredients and came up with several variations on the same basic recipe. Here is the way it worked out and even as I write about it my taste testers are confirming that it is a winner. One very curious note though. Does anyone remember a couple of years ago when Starbuck’s introduced their gluten-free orange cupcake nationwide? And then within months it disappeared never to be mentioned again? This cake tastes something like that, cake with a definite orange tang, only WAY better. This process takes several hours so I ended up doing it two days before putting together the cake. Wash the oranges really well. Place them in a pot and add enough water to cover them (but they will then float). Bring the water to a boil, turn it down to a gentle simmer, put a lid on the pot, and set the timer for two hours. One of my oranges split but the other one did not. After two hours drain the water off the oranges and set the pot with the oranges aside to cool. When they are cool enough to handle cut the peeling off across the top and bottom. Cut the oranges into about eight sections and remove any seeds. Also remove the white string down the center. The oranges are really mushy. Toss all of the orange pieces into the jar of your blender. 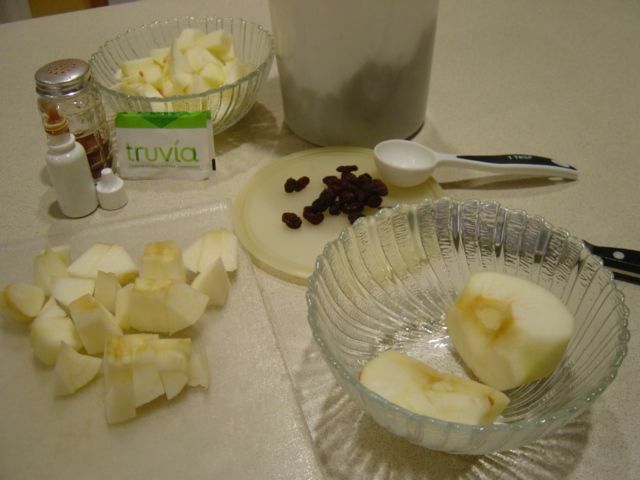 Process briefly on ‘puree’ – it becomes smooth very quickly. The puree is now complete so either begin the cake or store the puree, covered, in the fridge until you are ready to use it. Set the eggs (and puree) on the counter to lose the refrigerator chill. 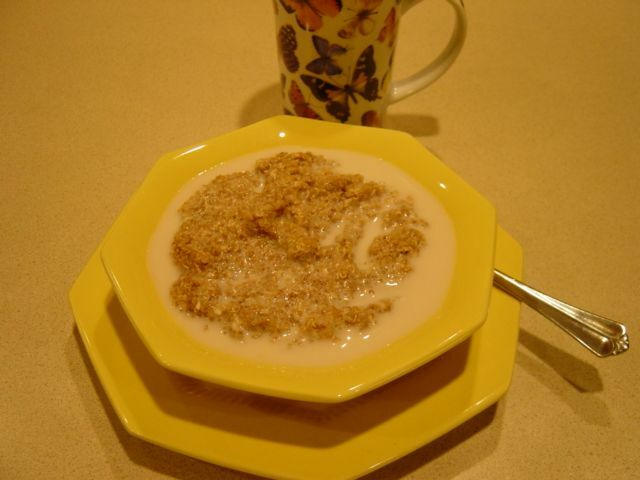 If the almond meal has been frozen to keep it fresh (a really good idea) then set it out as well – it is horribly clumpy when frozen but un-clumps very nicely when defrosted. Choose your sweetener. You need the equivalent sweetness of one cup of sugar. Measure the almond meal into a prep bowl, whisk in the baking powder, and set aside. Separate the eggs and place the yolks in the larger bowl where you will mix the batter while the whites go into a smaller bowl. Prepare your pan(s). This recipe fits an 8” or 9” springform pan. 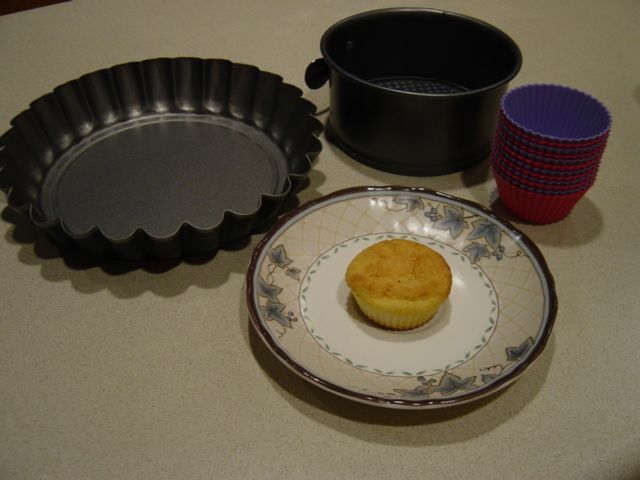 I used the batter to fill a variety of smaller pans and silicone cupcake forms. Even with non-stick pans and oil spray some cake parts stuck. Next time I will also use parchment paper. The cupcake forms actually did the best. However, wait until the cake(s) have completely cooled before trying to pull them out. This is not a quick, in-a-hurry recipe. Set your oven to 350*F.
Beat the egg yolks and sugar with an electric mixer until the yolks turn a slightly lighter shade of yellow. I added 6 drops of liquid stevia just to be sure that by using the no-cal stuff the cake would still come across sweet enough. Add the orange puree and continue beating. Add in the almond meal mixture and beat until completely incorporated. You may need a spatula to scrape down the sides of the bowl. Rinse off the beaters and use the mixer to whip the egg whites until they hold soft peaks. Add the whites to the almond batter and combine gently but completely – no stray bits of egg white! I used a large (50 ml) ice cream scoop to measure batter into the cupcake forms. A ripple-edged tart pan received about 1 1/2 inches of batter. And a 5 inch springform pan held the remainder. The cupcakes and tart pan were both done in 30 minutes. The spring form pan held a thicker layer of batter so it baked for 45 minutes total. The cakes should be toasty brown on top. This cake is very moist and tasty. It does not require embellishment. However, these were several nice serving suggestions from various sources. You would think that with Don being such an avid fan of Italian food that I would have come across this recipe long ago. Now I’m wondering how it would translate for my egg-allergic friends. When I stopped by The Caring Place and shared some of the cupcakes we had a discussion about how much the Lakanto costs. It certainly is a superior no-cal sweetener for baking but it works out to somewhere around $20 a pound including shipping charges. And although it is a staple at our house I rationalize the expense by using it sparingly throughout the year. Treats are treats and not our daily bread. Instead I feed my notorious sweet tooth with a variety of densely nutritious carbohydrate foods to keep it under control.